Leather Phone Case For the Turtleback "Flip"
The Turtleback Jitterbug Flip Leather Case comes with a rotating metal belt clip. The case features openings controls and ports. It allows full use of the phone with the case on. No need to remove the case when answering the phone. It protects your Greatcall Jitterbug Flip and is made from premium bonded leather. Its rotating and removable metal clip allows you to easily place your phone at your hip, or wherever is most comfortable. A plastic screen and keyboard cover phone clean from the dangers of the elements. Form Fit Leather Case for the Jitterbug "Flip"
Will This Case Fit Your Phone? This case is custom made to fit the GreatCall "Jitterbug Flip" model phone only. 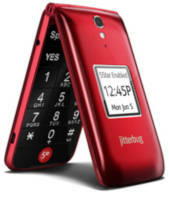 It DOES NOT fit the Jitterbug5, JitterbugPlus, Jitterbug Smart or older Jitterbug phones. Please check to verify that this is the model of your phone. Other flip phones may look similar but this case will most likely NOT fit other phone models. There are usually small differences in size, button & control locations, screen size and locations as well as camera lens locations that will cause this case not to fit. If you cannot find a case for your exact phone make and model, feel free to Contact Us for help. This case fits the Greatcall "Jitterbug Flip"
ON APRIL 12th, YOUR JITTERBUG FLIP ARRIVED, AND IT WAS CLEAR THAT THE INTERIOR OF THE CASE'S (2) SECTIONS. ON THAT DATE, 04/12/19, I E-MAILED ALTERNATIVE WIRELESS FOR AN RMA SO I CAN RETURN THIS ITEM FOR A REFUND. PLEASE ADVISE WHEN I MAY RECEIVE THE AUTHORIZATION FORM. I WAS SO LOOKING FORWARD TO REPLACING DAVID'S OLD CASE WITH YOUR PRODUCT! !